This was the worst French performance I have seen in years and for the most part, they didn't look capable of scoring zero. To be honest, the game was so one-sided it's hard to assess Ireland's game, and even more difficult when there were so many changes as Joe Schmidt wanted to give his key players for next week less game time than usual. 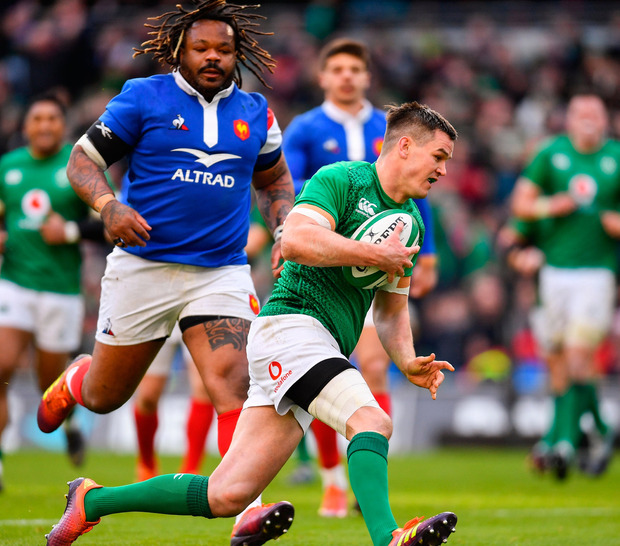 There were some good performances from Jordan Larmour, Garry Ringrose, Johnny Sexton in the backline while up front James Ryan and CJ Stander had their moments. The bonus-point win keeps Ireland mathematically in the hunt for a Championship win but even if they do beat Wales on Saturday, they really need Scotland to beat England and that's not likely. With seven changes to the Irish team that stuttered against Italy, Ireland needed a big performance and a return to form from some of Schmidt's key players, notably Conor Murray and Sexton. Some of that was achieved but again, because the game was so uncompetitive, it never materialised as a real contest. However, there is the old cliche – you can only play what's in front of you and that is what they did. Ireland needed to start well and they achieved that, after peppering the French line with a series of mauls. The soft French resistance soon folded when Rory Best opened Ireland's account. All very easy. It was all about the opening quarter and France looked all at sea. Once again in this season's competition, they failed to cover space at the back and their scum was struggling against a superior Irish pack. At this stage, the French were simply woeful in nearly every aspect of the game. Their exit strategy was poor, their tactical kicking poor and they seemed bereft of any discernable pattern of play. But Ireland were making things difficult for themselves with some sloppy play, when again the simple basics would have allowed them the cushion they deserved. So for 20 minutes or so the game stuttered a bit due to a surfeit of mistakes and handling errors. Then, on the 30-minute mark, there was something really positive for Ireland fans to cheer. For the first time this championship, the Sexton wraparound came off beautifully, with the out-half strolling in untouched – 14 to nothing. That extra confidence then nearly allowed the excellent Ringrose in after another Sexton skyscraper. Coming up to half-time, Schmidt would have been happy with the cushion but they had enjoyed nearly 100pc possession and territory. Never before have I seen a French team offer nothing in attack. In fact, they hardly ventured into Ireland's half in that first period. After another try to Ireland, by replacement Jack Conan, the game was over, a totally dominant display against a team that offered little apart from the last 10 minutes, when Ireland will be disappointed to have conceded two late tries. But in fairness, the result wasn't in doubt at that stage and it was a much-changed Irish side that finished the match, with Schmidt emptying the bench. So things remain the same: win away in Wales and the championship will be regarded as fairly successful. Schmidt will know not to read too much into this game and a positive is that the players all seemed to to come through the match unscathed, with the exception of the unfortunate Josh van der Flier. He will also welcome back some more of his key men for Saturday's big game. I have always believed that Ireland can win in Cardiff and after the Welsh display against Scotland on Saturday, that prediction has certainly not changed.